Bush Tours Fire-Ravaged Southern California President Bush visited Southern California Thursday to see the devastation caused by the wildfires that have been burning this week. Marine One, with President Bush and California Gov. 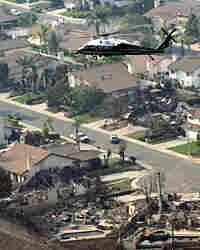 Arnold Schwarzenegger aboard, flies over wildfire damage on an aerial tour of Rancho Bernardo, Calif. Bush pledged support to help rebuild devastated areas. President Bush visited Southern California Thursday to observe the devastation caused by the massive wildfires that have been burning this week. 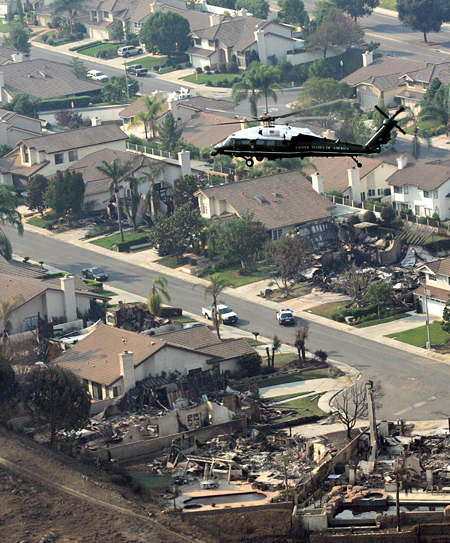 The president spent about 25 minutes touring the area by helicopter before landing in Rancho Bernardo, one of the hardest hit areas in Southern California. There he spoke for a few minutes, assuring California that whatever it needs, including more firefighters, the federal government was there to help. The trip and speech are an effort by President Bush to show he is interested in the situation and that the federal government is reaching out to the wildfire victims. The president has already declared the situation a federal disaster — making the state eligible for federal assistance — which he and the White House have been playing up. How much assistance the disaster designation will bring to California, though, is not yet known. When asked about his response to the disaster, Bush says he will let historians, analysts and California Gov. Arnold Schwarzenegger (R) decide that.